Canatxx is a new company which is planning to build a LNG gasification plant on the site of the old Octel works. The process is still in the planning process as off 2008 and has already received significant local opposition. Canatxx plans to build and operate a Liquefied Natural Gas (LNG) unloading and regasification terminal in Amlwch, Anglesey. It will provide a much needed flexible supply of UK peak demand gas to help domestic consumers, business and industry and power stations meet demand peaks. By comparison France and Germany respectively store about 25% and 22% of their annual gas needs, whilst the UK has gas storage of just 4%. 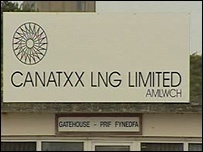 Canatxx is developing an LNG (Liquid Natural Gas) unloading and regasification terminal in Amlwch, Anglesey. The terminal site was originally built and operated by Shell for the extraction of bromine from seawater and for the unloading of crude oil tankers. Canatxx will operate the facility as an unloading hub for ships carrying LNG from anywhere in the world. The gas can then be transported to the Preesall storage facilities via a 70 mile undersea pipe. The LNG terminal twinned with the salt caverns can make Preesall a storage facility that is capable of storing and replenishing gas stocks throughout the winter or during an emergency. In short these two facilities combined, offer an economical, safe and secure environment to bring gas in to support the UK energy needs. The combination of the LNG terminal and gas storage is unique in the world. The facility will have the capacity to land and regasify 3 Bcf/day (85 million cubic meters/day) and will cost GBP330 million ($675 million), Canatxx said. UK gas demand reaches up to 400 million cu m/day in the winter. The company said it has begun discussions with potential partners and customers. It would likely need support from a major upstream LNG supplier and also from a downstream gas retailer. Canatxx itself is a privately owned US developer set up in 1988 that operates a gas pumping station in the US and is actively involved in developing new energy projects. The terminal is innovative because instead of storing lots of gas in onshore tanks and regasifying it slowly it will hold very little LNG onshore, instead using massive vaporizers to regasify the LNG as it arrives. Tankers would dock at an offshore buoy and feed in LNG through a pipeline to shore. Most LNG would be regasified instantly, using open rack vaporizers adapted from those used by the chemical plant that used to be based on Canatxx’s Amlwch site. The old Octel works heated seawater to extract bromine from the Irish Sea. Now the heaters could be used to heat up supercooled LNG. Only two 7,000 cubic meter LNG capacity storage tanks would be on shore, enough to hold small volumes of LNG for keeping equipment at the right temperature. That compares to the UK’s only existing active LNG import terminal, the Isle of Grain in Kent, where operator National Grid has a tank of 200,000 cu m LNG in size and is building several more tanks. Canatxx bought the Octel works site after it was shut in January 2004, with former owner Great Lakes moving its bromine sourcing to the Dead Sea. Demolition of the remaining Octel buildings is now set to begin in spring 2008 and it is hoped, subject to further planning consents, that construction of the new LNG reception facilities will begin in spring 2009 with the site being in operation in 2012. Canatxx had hoped to integrate the LNG terminal with a planned salt cavern gas storage facility at Fleetwood in Lancashire. But on October 16, 2007, following a planning inquiry, the central government rejected planning permission for the storage facility. Under that plan gas would have gone from the LNG terminal through a subsea pipe across from Anglesey to Lancashire where it could have fed into the storage. Canatxx still plans to feed gas in to Lancashire, through a subsea pipe. Gas would be transported by a new 114 km long pipeline, at a flow rate of up to 3 Bcf/ and 85 bar, the company said. It would connect into the national transmission system near Nateby, north of Preston, Lancashire. However, offshore unloading would not be new in the area. In the 1960s Shell was finding it difficult to bring enough oil into its Stanlow, Cheshire refinery. It built a facility off Anglesey and starting in 1974 crude was pumped from tankers offshore to Amlwch, then across Anglesey and along the north coast of Wales to Stanlow in Cheshire. This went on almost 20 years. The company is seeking to unload up to three tankers a week and estimates that a tanker could be unloaded in 24 hours. Although the company is thought to be considering standard sized LNG tankers of up to 150,000 cu m for deliveries, the offshore unloading would take place in relatively deep waters which might be able to accommodate larger vessels were that desired. A standard 150,000 cu m LNG tanker is equivalent to about 85 million cu m of regasified gas. Three such tankers per week would equal up to 13 billion cubic meters/year of gas. The canatxx gas storage system depending on using old salt mines in Cumbria to store the natural gas. Local opposition to the storage facilities in that area, has delayed any proposed development at the Amlwch site.